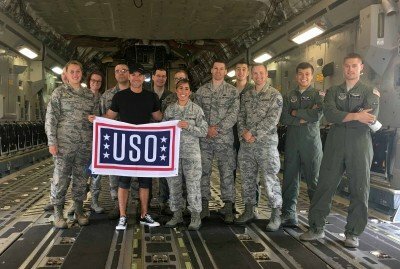 Singer/songwriter spends the week visiting, performing and bringing a time-honored Grand Ole Opry tradition to military families in celebration of USO’s 75th anniversary. DETAILS: An avid supporter of America’s service members, Campbell converted both of his USO shows into Opry Circle Throwdown performances. That’s right, the star traveled to each base with a signature Opry/USO mic stand and threw down a replica of the famed circle of wood from center stage at the Opry House before each USO performance.In addition to making audience’s swoon with his powerful vocals, Campbell also toured military aircraft and met one-on-one with service members.One of country’s brightest stars, Campbell launched onto the country music scene in 2011 and continues to exist in a perfect sweet spot between tradition and modernity. Born in Lyons, Georgia, Campbell played piano at his mother’s Baptist church for eight years starting at the age of 10. Among his many hit songs are “Keep Them Kisses Comin’,” “Fish,” “Family Man” and his latest critically-acclaimed single, “Outskirts of Heaven.” He is currently in the studio with producer Mickey Jack Cones working on his RED BOW Records’ debut album.February 4 marked the USO’s 75th anniversary and the kick off of a yearlong celebration around the world. Campbell’s USO tour was part of that celebration.The USO’s partnership with the country music industry dates as far back as the early 1940’s, when Gene Autry, also known as “The Singing Cowboy,” traveled to the Pacific and toured with a group of USO performers. Following in his footsteps and beginning what is now a long-standing tradition, stars of The Grand Ole Opry began touring with the USO in 1949.The Grand Ole Opry, the USO and Craig Campbell encourage fans to join them in connecting our nation’s service members to family, home and country. To support the USO’s Campaign to Connect, visit uso.org/connects and help the USO reach 1 million messages of support to military families stationed around the world.